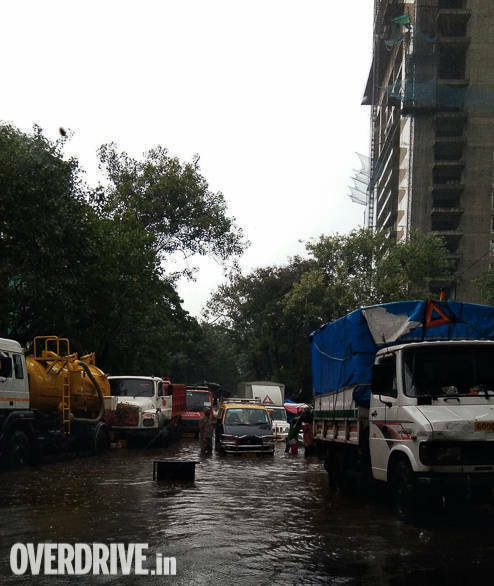 As we all know, the recent floods in Mumbai have resulted in massive devastation. And amongst the victims of the failure of the BMC administration and nature's fury, are thousands of cars and two-wheelers. Almost all workshops are overflowing with flood damaged vehicles. And the cost for repairing them will be substantial, especially in the case of luxury cars. So is there any way to carry out the repairs without spending a bomb. Actually repairs of flood affected vehicles need not always be expensive. One can also try a practical approach to fix them. Let me share my experience of repairing a flood affected vehicle. 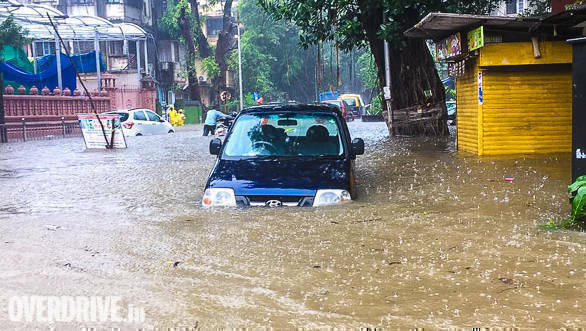 My wife had got stranded in her Maruti Alto in the massive Mumbai floods of 2005. Due to rising waters, she had abandoned the Maruti Alto and walked through the flooded streets to a friend's house. After the flood waters receded the next day, I reached the place where she had left the Maruti Alto. On opening the Alto's door, I found the water level had reached higher than the steering wheel. I drained the water out along with my driver and soon some local mechanics arrived and offered to start the car. I refused because I knew they would do lot more harm than good, if they attempted to start the car in that state. Instead I got the Maruti Alto towed to a friend's service station. There I had the all the seats and carpet removed and put out into the sun to dry. The battery was taken to an authorised battery specialist service centre for complete servicing. 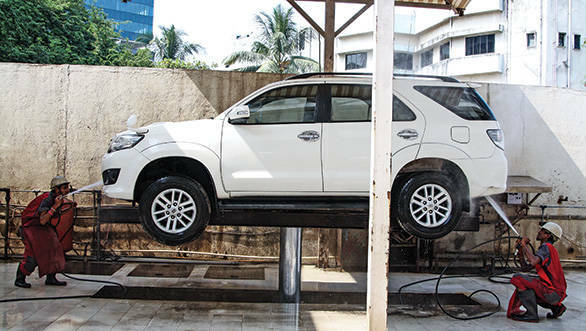 The car was also put up on the service ramp and washed and cleaned properly. Then the Alto's exteriors and interiors were painstakingly blow dried with compressed air. Next day the wheels were removed and I had the underfloor methodically blow dried again. Then the engine oil and filter were changed. Next I had the fuel tank drained and it also was blow dried. The radiator was emptied and the coolant replaced. After this the fuel filter and gearbox oil were changed. I then purchased six large cans of WD-40. This oil penetrating and water-displacing spray  WD-40, has been rated by many experts as one of the best tools ever. And I sprayed it everywhere. On the electricals and fuse box; all exposed screws, nuts and bolts and every joint, clip and connector. The complete engine compartment and all components were covered with WD-40. I even had the dashboard removed and sprayed WD-40 behind all the instruments and controls. The rear brake hubs were removed and WD-40 sprayed on all the brake components. The front disc brakes were sprayed too. Every inch of the Alto was covered with WD-40. For a day I just let it stay like that giving time for the magical water displacing spray to penetrate everywhere. The next day more WD-40 was sprayed. Then I replaced the spark plugs. The carpets and seats were cleaned and all exposed metal parts sprayed with WD-40. After the carpet and seats were fitted back it was finally time to connect the freshly serviced battery. Then the ignition key (covered with WD-40) was inserted and engine cranked. The Maruti Alto did not start at first attempt. Once more the key was turned. The engine coughed but did not start. A lump started to build in my throat. Had all my years of experience and knowledge of automobiles failed me? Another attempt, but nothing again. Once more and then the engine coughed and spluttered to life. Muddy water started rushing out of the exhaust pipe. I revved the engine, it was spluttering and misfiring. I kept my foot on the throttle. Gradually as the engine started to warm up, the engine note improved. After about 10 minutes it started sounding its normal self. Hugely encouraged by this I took it for a spin. Initially everything was squealing. The brakes also lacked bite. When I pushed down on the accelerator there was a squeal. If I turned the steering there was a squeal. But gradually the squealing became lesser. After parking the Maruti Alto inside my covered building parking, I kept the engine running the entire night. Next day I took it to the service station and had the engine oil and filter changed again. After this the Maruti Alto never missed a beat. For the next seven or so years it was with us, the car ran flawlessly. Yes, the wheel bearings did start making noise after a few months of the floods and I had them replaced. But that was it. I had spent around Rs 10,000 to fix my flood affected Maruti Alto. Most others spent well over 20 to 30 times this amount. My practical approach had worked. If I had allowed the local mechanics to try starting the Alto, it would most likely have resulted in a seized engine and several other problems. All expensive to repair ones. If your vehicle has been affected by the recent floods, you may want to try my approach. It might just end up saving you a lot of money.